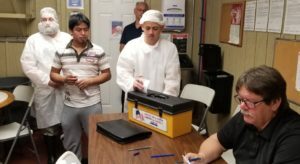 UFCW Local 152 members who work at Case’s Pork Roll in Trenton, New Jersey, ratified a new contract that includes better pay and benefits by an overwhelming margin on June 5. The four-year contract includes wage increases for every year of the agreement, a continuation of no health care benefit cost-sharing by members, and pension contributions by the company to maintain the current benefit level. Case’s Pork Roll is a family-owned business best known for their flavorful pork roll found in Local 152 union stores, including ShopRite’s private label brands.